Obama college cost speech: The White House wants to measure outcomes not inputs. The White House is tackling the status quo that’s sent college costs out of control. President Obama speaks at the University of Central Missouri on July 24, 2013, in Warrensburg, Mo. For decades now, America’s approach to higher-education policy has been a delightful synthesis of left-wing and right-wing ideas. In stark contrast to the K–12 universe, college is a playground for individual choice and market competition. The industry is lightly regulated. Schools teach the students they want to teach, and students attend the schools they want to attend. Then, from the left, comes money. Direct government financing of public institutions. Means-tested Pell Grants to low-income students. Subsidized loans for the middle class. We give students a wonderland of choice and then use tax dollars to try to make sure the choices are broadly affordable. 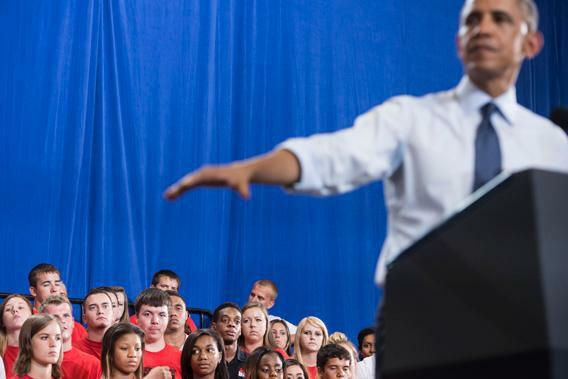 In a speech Thursday morning in Buffalo, N.Y., on ways to enhance college affordability, President Obama will likely lay out policy measures that, while relatively modest on their own terms, propose to radically subvert that bargain on a conceptual level. The president has decided, essentially, that the old bargain has failed. The liberal idea of pumping more federal dollars into the system—something his administration has done enthusiastically—has failed to deliver affordability. More controversially, although America’s elite universities are the envy of the world, the White House views the system of open choice and competition as having essentially failed the marginal college student. Far too many students enroll, take on debt, and fail to graduate, while far too many schools face weak-to-nonexistent incentives to think about how to become more cost-effective. In other words, he wants to find ways for the federal government to put its muscle behind an idea that’s both modest and radical: that public money should pay for outcomes, not just more stuff. Attempting to nudge the health care system in that direction was a key element of the Affordable Care Act. Nudging K–12 education in that direction has been the centerpiece of the Obama education agenda. Bringing it to the realm of higher education in a serious way would be extremely difficult but also an extraordinary achievement if we can be sent down that path. The fundamental problem of higher education is that the public rates schools mostly based on inputs. The most important input in the conventional thinking about colleges is the students themselves. A good college is essentially a college that’s hard to get into. That’s why Harvard and Yale are “better” than Georgetown and NYU, why UCLA is “better” than UNLV, and why the selective schools that dominate the media conversation as a whole are better than the nonselective schools that serve the bulk of low-income students. Competition among schools is dominated by the quest to attract better applicants by spending money on other inputs. That means recruiting star faculty, building nicer dorms, spending financial aid money on students from prosperous families, and more. There’s ample evidence that the more selective schools really do lead to better student outcomes on the whole. But this is an extremely crude proxy, and it creates a dynamic where the incentives post to ever-rising spending by schools. This means competition drives an upward cycle of spending. The alternative approach would be to try to define a good school as one where tuition is low relative to graduates’ earnings, or one where the graduation rate is higher than the demographics of the student body would suggest. Of course, if it were easy to devise an outcomes-based way of evaluating colleges, it would have happened already. And historically, the higher education lobby has fought viciously against even minimal disclosure of basic measures of performance. Tying public funding to good performance would be hugely controversial and would require the agreement of a Republican Congress that’s rarely been eager to cooperate with the administration. The first step—of simply trying to create a measure of performance that gains some measure of public legitimacy—would be easier. The White House has already tiptoed down this path with its College Scorecard, announced in the State of the Union address. But despite the name, the scorecard is more of a data dump than a ranking system. Visiting my in-laws in Kerrville, Texas, I’ve often wondered about the local private college, Schreiner University. The scorecard tells me that Schreiner has about average net tuition, a below-average graduation rate, and a below-average loan default rate. But there’s no overall score, no weighting of these characteristics, and no adjustment of any of this data to take into account the kind of population served. The first step down the path Obama wants to take American higher education would be to turn this into a true ranking system, so parents, students, donors, and potentially lawmakers can judge options against one another when deciding where to go or who should get money. That would be in many ways a very modest step, but its very modesty makes it achievable. And in theory at least, a credible system for measuring college quality could set off a revolutionary series of changes throughout the higher education system.